Three outside rackets pockets, plus 2 shoe/ball pouch and change pocket. One large accessory pocket. Backpack style shoulder straps. 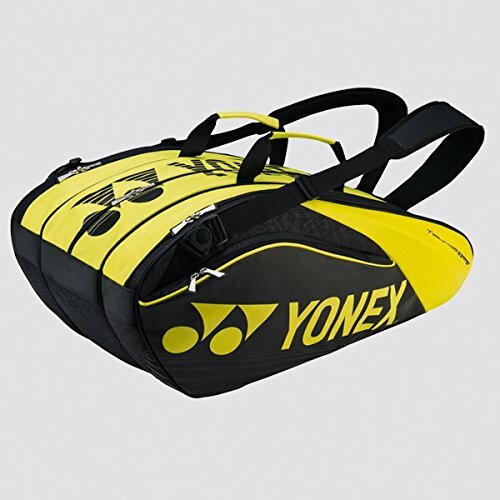 Yet another HOT badminton bag from the boys at Yonex. Step up your style, utility, and overall game with this bag that can not only make you look like a pro, but carry just as much as one. Very roomy and holds a ton of stuff: shoes, rackets, refreshments, food, drinks, snacks, h'or doeuvres, six-packs, cans, bottles, kegs, party balls, and anything else you may or may not need for the court! Thermal Racket Bag (9-Pack): Three outside racket pockets, plus shoe/ball pouch and change pocket and large accessory pocket. Backpack style shoulder straps and racket separators.